Eurocom Corporation (www.eurocom.com), a leading developer of long lifespan, fully upgradable notebooks, high performance mobile workstations and mobile servers is adding the new NVIDIA GeForce GTX 580M graphics processing unit (GPU) to the available GPU options in the EUROCOM Panther. The addition of the NVIDIA GeForce GTX 580M gives Eurocom customers an ultra high performance GPU in single and SLI (dual) configurations to fit inside their purpose built system. The addition of the NVIDIA GeForce GTX 580M, the highest performing mobile solution from NVIDIA, gives Eurocom customers a complete choice of video processor options to integrate into an embedded design or configure into their new Eurocom system. “The Eurocom Panther series offers the most versatile and the most upgradeable high performance notebook form factor solution available on the market. It offers the functionality of a high end notebook, Mobile Workstation or Mobile Server depending on configuration. With NVIDIA’s new GeForce GTX 580M we offer another level of high performance GPU upgradeability.” said Mark Bialic, Eurocom President. The EUROCOM Panther is designed specifically for creative and design professionals and digital content creators who demand maximum performance in a portable workstation. As a complete, powerful, portable computing solution, the EUROCOM Panther provides a perfect alternative to a traditional, desktop workstation, without sacrificing performance. 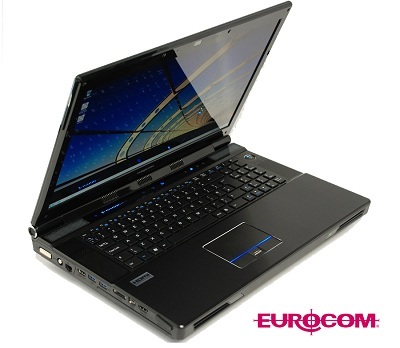 The EUROCOM Panther provides workstation, gaming and server-calibre capabilities with 3.25 Terabytes of storage featuring four physical drives and RAID 0/1/5/10, making it the perfect mobile workstation or portable server for users who demand extra-large capacity storage and reliability. It offers powerful 3.46GHz Intel Core i7 Processor Extreme Edition I7-990X or 3.46GHz Xeon X5690 processors running at 6.4GT/sec bus speed with 12MB L3 cache, which deliver exceptional multi-tasking and multi-threaded performance. It also includes a Gigabit Ethernet port on-board, plus HDMI, eSATA, and DVI ports, with a 17.3" Full 1080p HD display, and support for a full size keyboard. The EUROCOM Panther supports a full range of professional level and Enthusiast level GPU’s to fit any requirement. Supported video technology includes Professional Level NVIDIA Quadro GPU’s, enthusiast level NVIDIA GeForce and AMD Radeon GPU’s. The NVIDIA GeForce GTX 580M plays the latest games at 1080p and in 3D. For maximum performance Eurocom supports two GeForce GTX 580M GPUs running in SLI mode in certain systems.